Boy, how time flies! Another quarter is behind us! Yeeouch. Not exactly the best stats, eh? I only won 25% of the trades I entered last quarter, and it resulted in a total loss 0.70%. Overall, I can’t say I’m too pleased with these results. Why would I be? It’s the first time since Q4 2011 that I ended a quarter in negative territory. However, I think I did pretty good damage control by keeping my average losses smaller than my average winners. And on one occasion, I even turned a would-be loser into a profitable trade. What really bums me out though is that I was actually a decent level above watermark at the end of January. 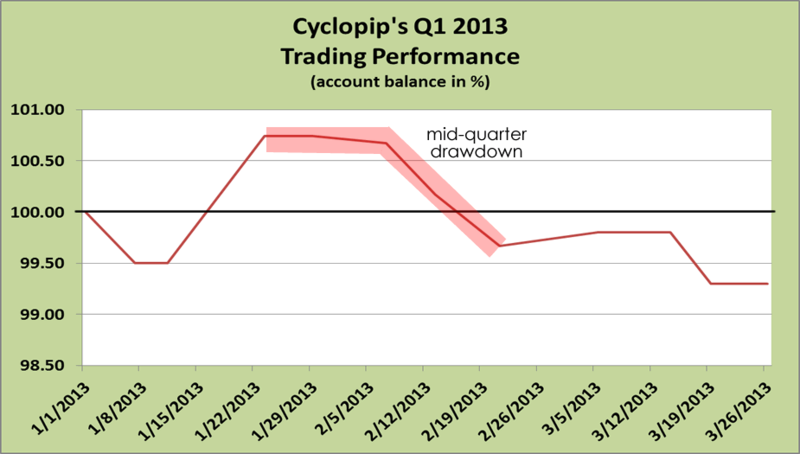 But then I went on a losing streak and incurred a 1.07% drawdown. @#$%^&! This trade was my saving grace – it yielded a return of 1.25%, which translates to a solid 2.5:1 reward-to-risk ratio. If it weren’t for this big winner, my account would be much deeper in the red than it is. I held on to this trade longer than usual since it was based on a long-term trend, and boy did it pay off! What’s funny is that I might not have even spotted this setup if I hadn’t stepped out of my comfort zone. 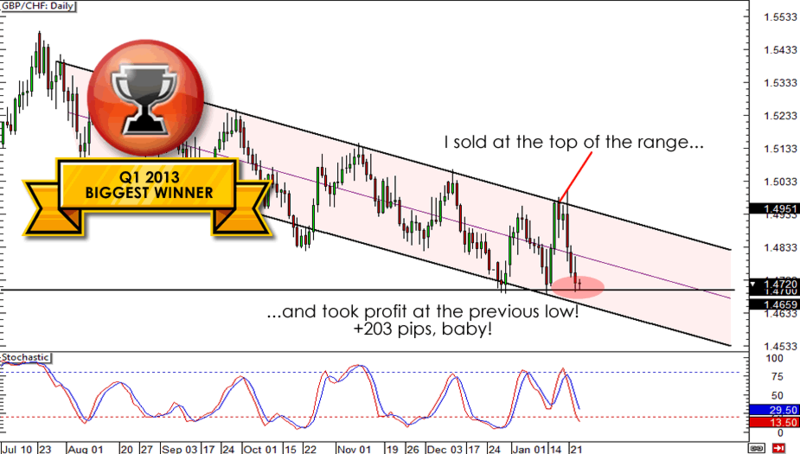 As some of you may know, GBP/CHF isn’t a pair that I trade often, but because of this winner, you can bet your bottom dollar that I’ll be checking in on it every now and then from now on! Thanks to good risk management, I was able to limit all my losses to just 0.50%. But this loss stands out for two reasons. First, it was my largest pip loss of the quarter. Second, it was my first trade of the year, and I’ve been playing catch up ever since. I tried to hop on the short JPY trend, as I tried to buy EUR/JPY on a shallow retracement. Unfortunately for me, EUR/JPY came crashing below the Fib levels, but soon bounced back higher! What a major bummer! Short Yen trend coming to an end? 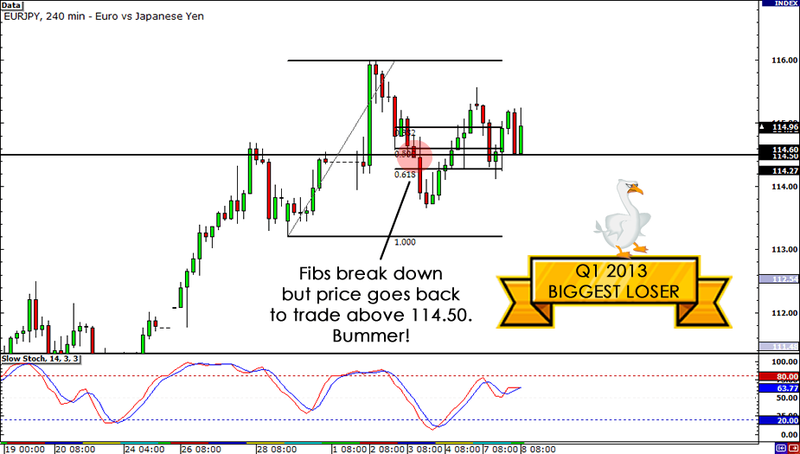 The yen bears continued to dominate the markets at the start of the year, as they pushed yen pairs higher and higher. EUR/JPY rose over 1,000 pips to hit a new 3-year high. Meanwhile, GBP/JPY rose 700 pips before topping out around 148.00. However, it seems that the short yen trend could be coming to an end soon, or at the very least, we may see a strong retracement. On the daily charts of EUR/JPY and GBP/JPY, we can see a double top and a head and shoulder formation forming respectively. Granted that these are normally reversal patterns, I won’t be surprised to see the yen gain more momentum during the second quarter… if the Bank of Japan doesn’t get aggressive with easing, that is! For the better part of the quarter, we could see that it was fundamentals that dominated each currency. What I mean by this is that instead of higher-yielding currencies moving in line with each other depending on the whims of risk sentiment, we saw individual currencies react more strongly to domestic news over the past couple of years. More specifically, it was central bank rhetoric that weighed heavily on price action. Whenever the prospect of more quantitative easing or lower rates was brought up by a central banker, the domestic currency was more than likely to take a beating. For example, the pound kept dropping against its major counterparts as soon as current BOE Governor Mervyn King joined the dove camp and called for more QE. One thing that I’ve learned from this quarter is that I can’t always stick to my bread and butter, which are the yen pairs. I’m starting to notice that some really good setups emerge on those really exotic pairs. For example, that channel on GBP/CHF held for the longest time and if I had noticed it earlier, I could have played that repeatedly and made mad bank! So for the next quarter, I’d like to make a more concentrated effort to look at the exotic pairs, as it seems that ranges tend to hold more strongly on some of them. That’s it for now, so it’s time to take a short break and enjoy this weekend. But before I head out to catch up on my beloved sports programs, I’d like to give a warm hug to all of you who have shared your insights through Twitter, Facebook, Google+ and MeetPips.com! Thanks for putting the time and effort to share your thoughts and help me on my journey to becoming a consistently profitable trader!